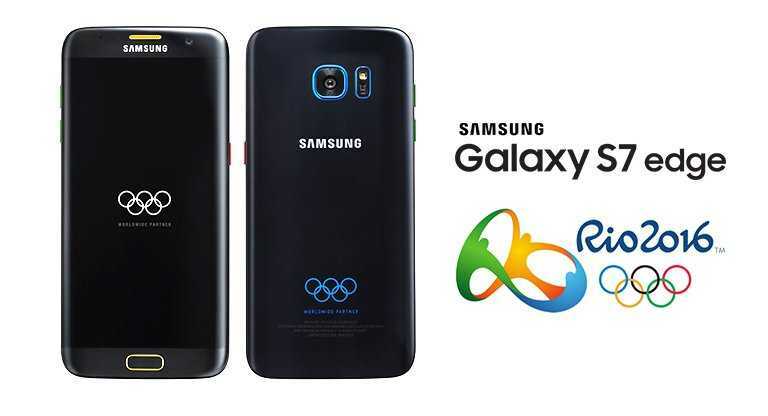 Samsung is a global partner for the upcoming Rio 2016 Olympics and to help millions that will be heading to Brazil both physically and virtually commemorate this event, the Korean tech giant has unveiled a Samsung Galaxy S7 Edge Olympic Edition to go with the event. This phone has been in the rumor mill for quite some time now. However, Samsung has finally confirmed and actually announced the phone. The success of Samsung Galaxy S7 and S7 Edge ever since their release has seen Samsung exploring more ways to make the most out of these two. As usual, a Galaxy S7 Active is already out, however, Samsung surprised the gaming world by introducing a Batman-inspired Samsung Galaxy S7 Edge Injustice Edition. On the back of the release of this phone, the tech giant has again come in with another Galaxy S7 Edge that is inspired by the 2016 Olympics event. Just like the rumors have been pointing out, the new Samsung Galaxy S7 Edge Olympic Edition will only feature cosmetic changes and nothing much. This means that the handset keeps all of the internals that are found in the standard Galaxy S7 Edge. This is exactly what happened with the Galaxy S7 Edge Injustice Edition. As a result, those who get to use the Galaxy S7 Edge Olympic Edition will still come across an Exynos 8890 SoC that is paired with a RAM of 4GB and 32GB of onboard storage. The screen size remains at 5.5 inches and it is still a Super AMOLED QHD panel. There is a 12MP camera on the back and a 5MP sensor for selfies. As for the battery unit, the S7 Edge Olympic Edition keeps the same 3600mAh size used on the standard S7 Edge. Samsung has also preloaded the phone with themes and wallpapers associated with the Rio 2016 Olympic Games. It gets even better as the phone will not be limited to those taking part in the event directly. Instead, Samsung says that anyone can have it, although it will be available in limited stock. Samsung Galaxy S7 Edge Olympic Edition will start selling as from July 18 and it will be available in limited countries, including the U.S., Korea, China, Germany and the host nation of Brazil. At the time of this writing, a German website has already gone live and apparently, potential buyers of the Galaxy S7 Edge Olympic Edition can pre-order this device via the site for a whopping €879. This is equivalent to about $970. The Galaxy S7 Edge Olympic Edition will sell in limited numbers, with Germans set to receive only 2,016 pieces with ID numbers ranging from GER-0001 to GER-2016. Is the one+3 compatible with the Samsung s2 gear watch? Is the One +3 compatible with the Samsung S2 watch?